If you've blown all your money on a summer holiday, don't feel that you'll have to neglect your plug-in folder for a while, for free effects and instruments continue to hit the internet. This week, there's yet another guitar amp, a budget option for T-Pain wannabes, the obligatory synth, a chorus effect and - unusually - an instrument devoted to modal jazz. 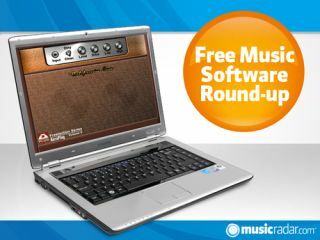 If you've got some free software on the way, do let us know about it by emailing musicradar.pressreleases@futurenet.com. You really are spoilt for choice if you want a free virtual guitar amp. This example is a combo affair that offers clean and dirty channels and is said to mimic a Mesa-style amp. If you had to pay for it, low CPU usage and an easy to use interface would also be selling points. Robotised vocal effects are all over the place at the moment; if you can't afford to shell out for a copy of Auto-Tune, this could be the way to get them on the cheap (for nothing, in fact). It's not the most editable plug-in we've ever seen, but we like that comic book-style GUI. If you stacked all the free software synths in the world end to end then… well, they'd take up no space at all as they're not real. There are certainly lots of them, though, and Mothman 1000 is another to add to the pile. It's a 2-oscillator, 2-LFO beast that "also features an oscilloscope, just for fun". It looks like a bank vault, but Quatropolis is actually a chorus effect. Its name alludes to the fact that it offers four delay lines, and the developer believes that it can deliver everything from soft modulations to deep detunings. The interface shouldn't cause you any grief, comprising just modulation amount and speed controls. OK, this is a bit different: a synth that 'knows' and will conform to the rules of modal jazz. The idea is that you press a key and listen as it automatically picks the correct chord (though you can specify the key and mode). Features include an alias-free oscillator, a self-oscillating filter, LFOs and envelopes.